The Hindu goddess of learning, wisdom, music,arts is Saraswati. She is part of the Tridevi or trinity of Goddesses of Lakshmi, Saraswati and Parvati. They help the trinity of Brahma, Vishnu and Shiva to create, preserve and regenerate the Universe, and are their consorts respectively. She was first mentioned in the Rigveda and is worshipped to the present time. She has been depicted in sculpture and paintings. On Vasant Panchami, young children are initiated into the world of learning by learning how to write alphabets. The Jainas of Western and Central India revere the Goddess and the Buddhists also consider her as the Goddess of learning. She has believers in Nepal,Vietnam, Indonesia , Myanmar and Japan besides India. 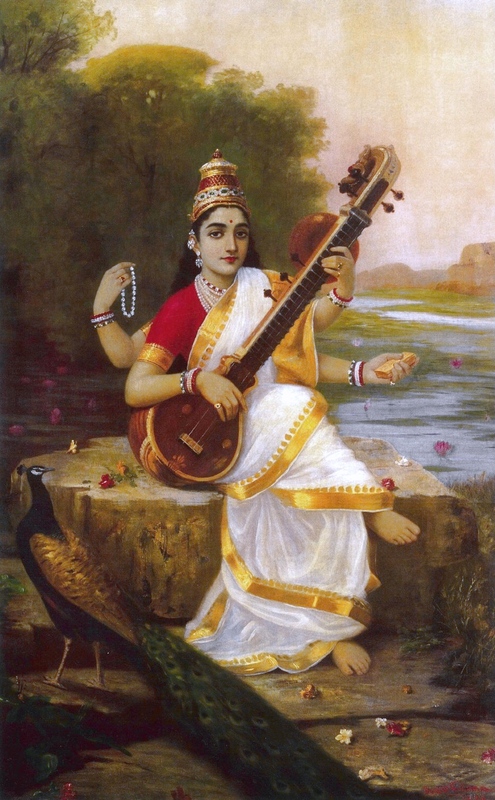 Goddess Saraswati, Raja Ravi Varma. 19th century. Saraswati ,painting on cloth,Eastern Tibet, Kham region, 18th century ,LACMA,USA. Saraswati, sculpture, 10th century, Walters Art Museum, USA. Saraswati, Hoysala sculpture, 13th century,Chennakesava temple , Somanathapura, Karnataka. Saraswati, Ganesha in a painting, Marwar, 1825, Rajasthan. Amardas Bhatti (attr.) Ganesha, Saraswati and Jallandharnath, Marwar, ca. 1825, Mehrangarh Museum Trust. Saraswati, A folio from the Rukmini-Parinaya series , Kotah painting, 1700,Rao Madho Singh Museum Trust, City Palace, Kotah. Rajasthan. The legendary scene above depicts a king paying homage to a hermit seated on a bagh chhal in a lovely hermitage. The great respect shown by rulers to holy men can be sensed in this painting thought it deals with a mythological theme. The presence of Vishnu and Saraswati is indicative of the auspiciousness of the occasion and their presence also signifies their showering blessings on the royal personage of the king. The elongation of the figures is a feature derived from Mughal painting during the reign of Aurangzeb. Goddess Saraswati is the consort of Brahma who is the creator. She being his consort is the goddess of creative sciences. Music, poetry , learning and language are all attributed to her. She is also called Vach meaning speech. She is believed to have invented the Sanskrit language and the Devanagari script. She is mentioned in the Rigveda as Vach. 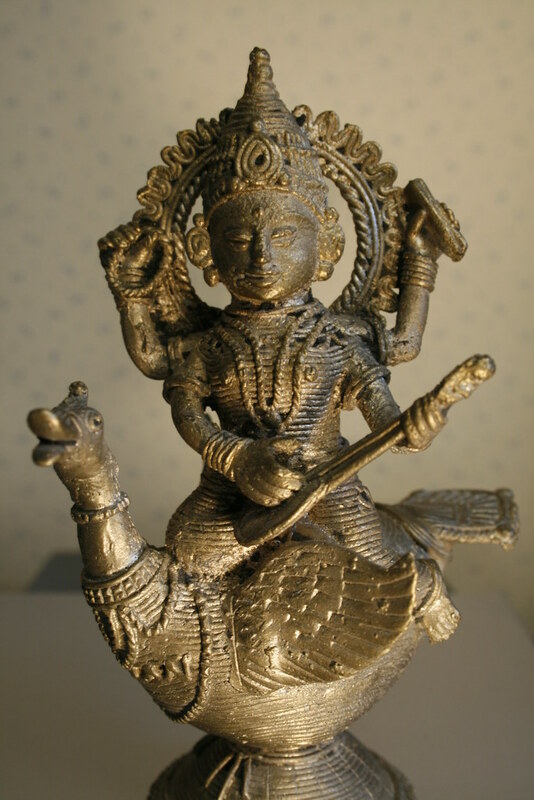 She is depicted in sculpture and paintings as a beautiful woman riding a swan or peacock, holding a veena, musical instrument. On Saraswati-puja day, once in a year, scholars, students and musicians worship her. Saraswati with Lord Brahma, Mallikarjuna Temple, 13th century,Basaralu, Mandya District,Karnataka. The Goddess of learning is believed to have been produced by Lord Brahma who married her. In the Puranas ther is however another story. Once all the three Gods, Brahma, Vishnu and Shiva met at Vaikunta for a discussion and from their combined energy a brilliant female from emerged, whom each God wanted to possess. She divided herself into three namely, Saraswati Lakshmi and Parvati. She is known and worshipped by other names like Sharada, Pustakadharini,Vidyadayini Hamsavahini and Chaduvula-thalli. The Goddess is often shown in a white sari seated on a white lotus representing light, knowledge and truth.She is shown as having four arms symbolising manas, buddhi, chitta and ahamkara, that is mind, intellect,creativity and self-consciousness or ego. The hands hold a book or pustaka signifying learning or the vedas, a rosary or mala signifying meditation, a water-container signifying purity and a veena, a musical instrument. A swan or hamsa is her vehicle and is seen sitting near her feet. The hamsa is a scared bird who can separate milk and water. This represents the ability to differentiate between good and evil, unreal from the real. A peacock is sometimes shown with Saraswati. The peacock or mayura represents splendour. The Goddess is usually depicted next to a river as she is also known as a river goddess. Saraswati, Mysore Painting,19th Century,National Gallery of Modern Art,New Delhi. Saraswati ,Kalighat painting, 19th century, Kolkata. Saraswati appears to Yajnavalkya, illustration from a book,University of Toronto, Canada. Image of Saraswati, Durga Puja,21st century, Köln (Cologne), Germany. 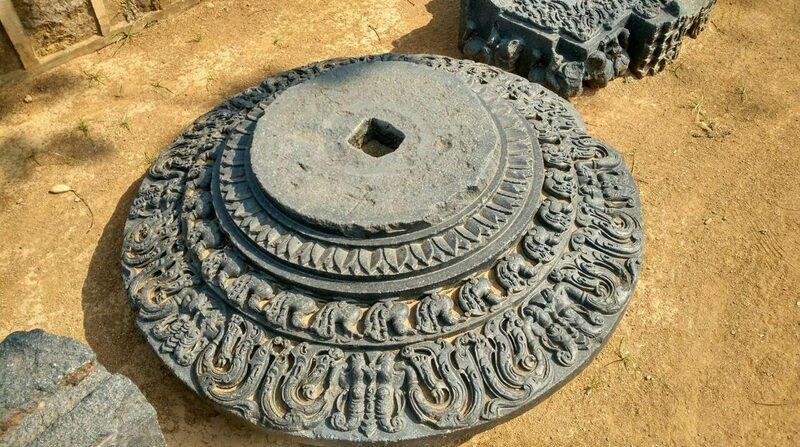 This entry was posted in art history, history of india, Saraswati, sculpture of india and tagged art history, Lotus, Saraswati, sculpture on January 10, 2017 by historyreads.